It was Sunday night, and we were chilling on the sofa, watching an episode of French “Top Chef”. The skill is on another level, and shoves Masterchef onto the sidelines. 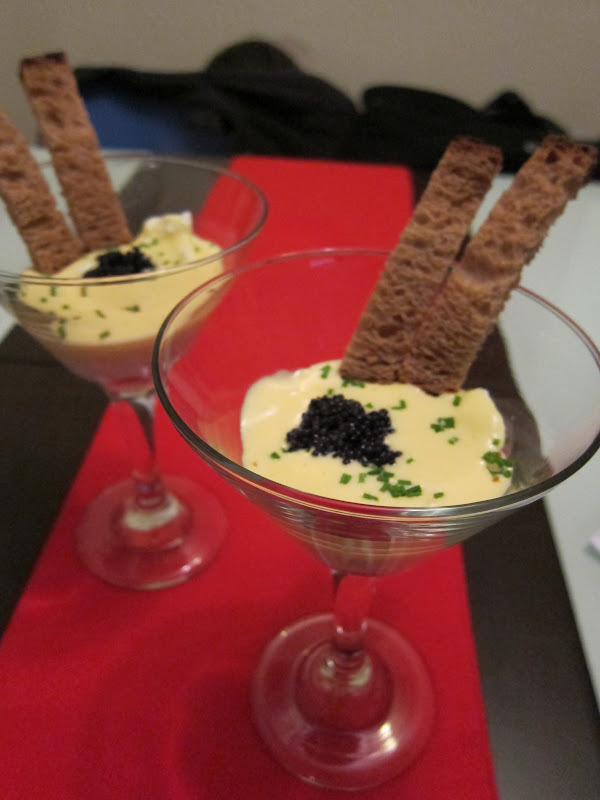 In the episode we were watching, the contestants are given caviar, and need to create a dish around it. 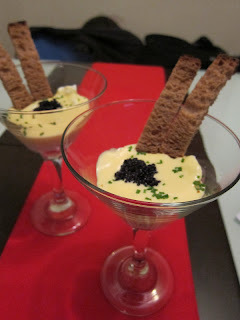 One makes a shot of egg yolk, cheese foam and caviar. I was inspired, and even though it was 11pm, I felt the need to get up and make it. We hadn’t eaten dinner yet, so why not?I came up with something that I like to call a “Refrigerator Jambalaya” dish – I look in my fridge, and see what I can make with the contents. I always have eggs, and I have lumpfish caviar left over from Valentine’s Day. 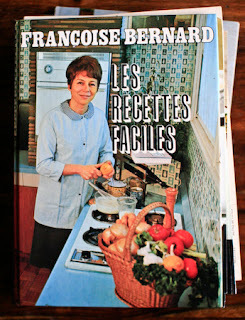 I also wanted to make a sauce to balance out my creation, so I referred to my bookshelf and picked up “La Cuisine – 1000 Recettes Facile” by Françoise Bernard. 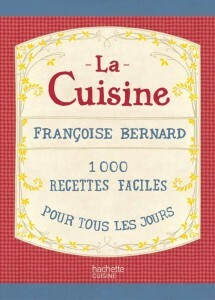 This is considered the Bible of French Cooking, and Bernard is famous for making everyday French classic recipes accessible and simple. PB’s mother showed me her retro 1965 edition, it’s pages falling out, it’s corners dog-eared and it’s cover splotched from years of use. I was given the latest edition as a Christmas present, but it is in French so I need a little bit of time to translate it before I cook. It is available from Amazon in the English edition, if you’re interested. 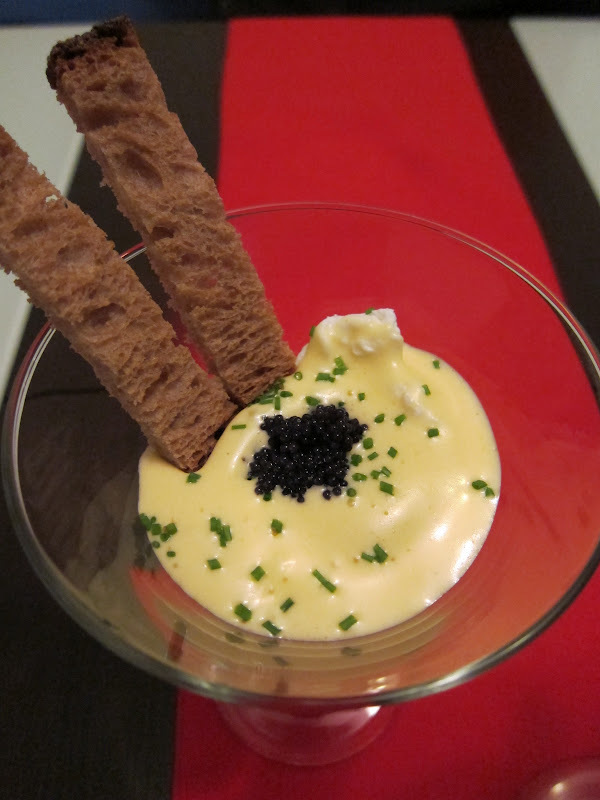 I decided to make a “Poached egg with Hollandaise Sauce and Caviar Martini”, using the recipe from “La Cuisine” for my hollandaise sauce. The recipe calls for you to used a thick bottomed pan to make it – I don’t have one so I cooked it in a bain marie. The only thing ‘martini’ about it was the glass. But I imagine that replacing one of the tablespoons of water with vodka might work … it’s always worth a try! It was my first time making it, so I found this youtube video very useful in demonstrating the method for making hollandaise. 1. Add the eggs, lemon juice and water in a large bowl, and start whisking continuously over a bain marie, until white and thick, around 3 1/2 minutes. ♥ ♥ Be sure to whisk continuously, or else the mixture may cook and go lumpy. 2. Take off the heat, then add the melted butter, bit by bit, whisking and incorporating before adding more, until it’s all mixed in. Season with salt and pepper (I used white pepper). I reduced the amount of butter, and it still tasted great. ♥ ♥ Whisking in the butter too quickly will cause the sauce to break, or separate. To serve, I placed my poached egg in the bottom, spooned in one heaped spoon of hollandaise sauce, topped it with a spoon of caviar. I toasted some bread and cut them into fingers, to dip into the runny yolk, for a perfect bite of all the ingredients. We ate it with a simple salad, but it would be a great, luxurious breakfast as well (hold the vodka)! Bon appétit! If you’re interested in watching Top Chef, click here.